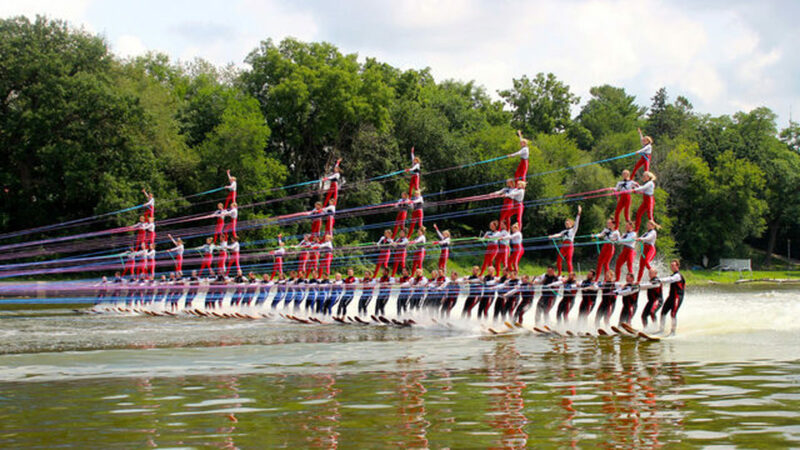 The 80-person water-ski pyramid attempts to set a record for the Guinness Book of World Records. Mercury Marine was the power behind the Rock Aqua Jays Water Ski Show Team last Saturday as they attempted a Guinness World Record for building the largest-ever human pyramid on water skis. According to Channel3000.com, two teams called the Webfooters and Aquanuts came together to build the 80-person pyramid. The towboats were powered by triple 300-hp Mercury Racing outboards for a total of 1,800 hp. The engines were spinning four-blade Revolution 15-inch pitch propellers. To overcome the drag that would be created getting all the skiers out of the water, the drivers built a quick-release system and used two boats for the initial pull. The pull boat was about 100 feet ahead of the main towboat and had a strap attached to the quick-release on bow eye of the primary boat. Once the skiers were up and on top the water, the quick release was activated and the entire pyramid was towed behind a single boat. The Rock Aqua Jays are 20-time National Champions who perform weekly water ski shows on the Rock River. The two groups will find out from Guinness in the next two weeks if they successfully made the new world record, according to the station.